To help as many people as possible understand their networks as much as possible. As goals go that’s pretty broad and implies a lot of work. Open source project hosting services didn’t exist in 1998 so in the olden days we pretty much ate sand. For example, I made thirty releases in the first year. Twenty of them were first two months. That’s because I was our revision control system1. Contributors would send me patches, I’d apply them to my source tree and then make a release. Everyone would then sync their source directories with the new release. Fortunately we stopped doing that in short order. Other parts of the project followed similar paths. The first Windows packages were ZIP files with no capture driver. Our first web server was a 40 MHz SPARCstation IPX with 64 MB of RAM. We inflicted X11 on our macOS users far longer than we should have. The project grew from those humble beginnings to what is today – the world’s most popular network protocol analyzer. The goal is still there, and many people and organizations are helping us achieve it. We have a wonderful sponsor in Riverbed, which pays my salary, provides our infrastructure, and sponsors SharkFest, our developer and user conference2. It’s managed by Janice Spampinato, who does a spectacular job of making sure our community can share its knowledge face to face in a welcoming environment. Speaking of SharkFest, we’re having three of them this year! Laura Chappell does a correspondingly spectacular job with Wireshark University, educating users throughout the year. Our user and developer community is second to none in its expertise, knowledge, and willingness to help. I could not be more proud of what we’ve accomplished and look forward to the challenges and opportunities. On behalf of the Wireshark development team, thank you for your support. 1. Never, ever do this. If you want to start a project, just commit your code to GitLab. Or GitHub. Or BitBucket. Or anything else that doesn’t involve manual patching. 2. If your career involves looking at packets you should maybe show up once in a while. Actually, quite a few things have changed. The user interface has been completely rewritten using a different interface library (Qt). It has been streamlined so that you can work faster and it should have a better look and feel on every platform. The screenshots above are similar because we’ve also tried to ensure that the new UI is familiar to current users. The features you’re used to are still there and in the same place (or at least nearby). They should work much more smoothly, however. Capture options. Capture options have been simplified and consolidated. In 1.12 they are spread out in many places across several windows. In 2.0 they are in two places: the Capture Options dialog (Capture→Options or the “gear” icon in the toolbar) and the Manage Interfaces dialog, which you can open by pressing “Manage Interfaces” in the Capture Options dialog. Streamlined preferences. Preferences windows usually aren’t something to get excited about and this is no exception, but it’s important to note that in the process of removing clutter some preferences have been removed from the main window. They’re still available in the “Advanced” preference section which lists every available preference item. Translations. Thanks to the hard work of many contributors the new interface supports multiple languages. You can now select between Chinese, English, French, German, Italian, Japanese, and Polish in the “Appearance” preferences section. Many more translations are underway. 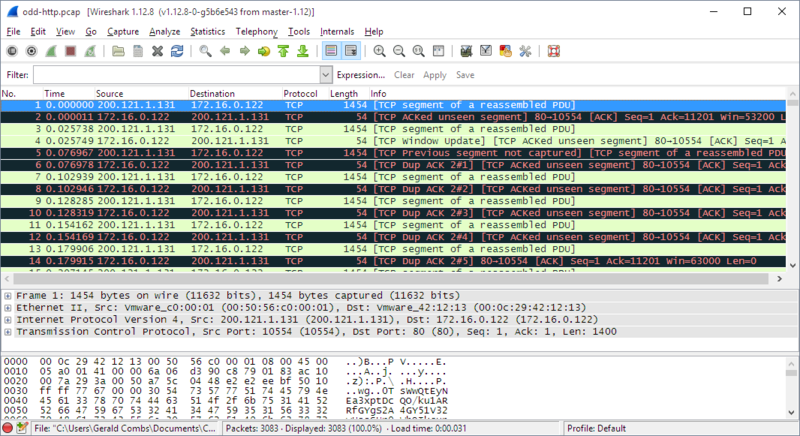 You can see the status the translation efforts and help out with the effort at https://www.transifex.com/wireshark/wireshark/. Related packets. As you scroll through the packet list you might notice little symbols pop up along its left edge. For example, you might see left and right arrows for DNS requests and Replies, or a check mark to denote an ACKed TCP packet. These are related packets. This exposes some plumbing we’ve had in place for a long time, but it’s now shown in the main window instead of buried deep in the packet detail tree. Intelligent scrollbar. As you scroll through the packet list you might notice that the scroll bar itself looks odd. 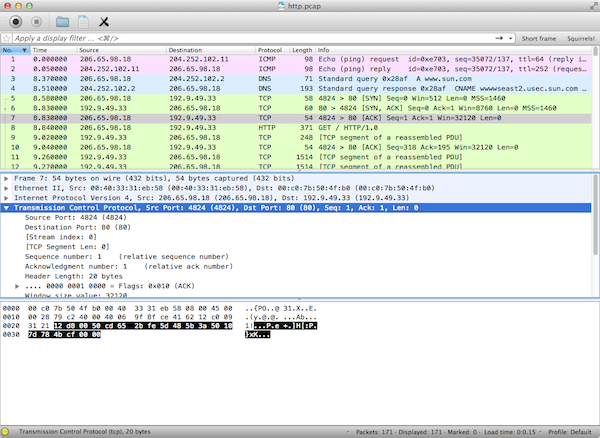 It now features a map of nearby packets, similar to the “minimap” available in many modern text editors. The number of packets shown in the map is the same as the number of physical vertical pixels in your scrollbar. The more pixels you have, the more packets you can see. In other words, if you use Wireshark regularly you now have a legitimate business case for a retina display. Statistics dialogs. The dialogs under the Statistics and Telephony menus have seen many improvements. 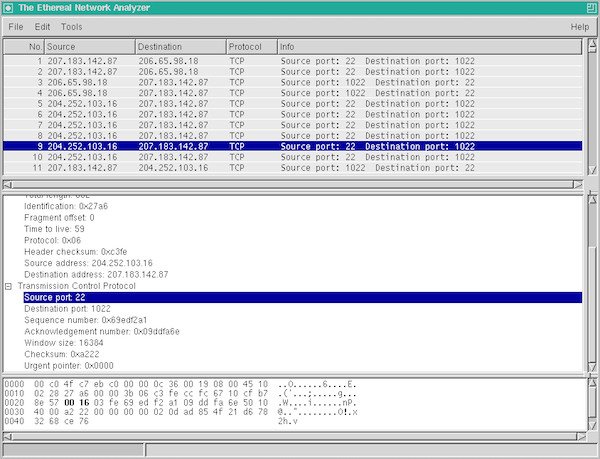 The backend code has been consolidated so that most of Wireshark’s statistics now share common internal logic. This in turn let us create common UI code with many workflow improvements and a much more consistent interface. I/O Graph dialog. You can now graph as many items as you like and save graphs as PDF, PNG, JPEG, and BMP. Graph settings stay with your profile so you can customize them for multiple environments. Follow Stream dialog. You can now switch between streams and search for text. General dialogs. Many dialogs now have context-aware hints. For example the I/O Graph and Follow Stream dialogs will tell you which packet corresponds to the graph or stream data under your cursor. Most of them will stay open after you close a capture file so that you can compare statistics or graphs between captures. If you want to see a live demonstration of the new UI, Laura Chappell and I are presenting a webinar next week on the 12th at 10:00 AM PST. 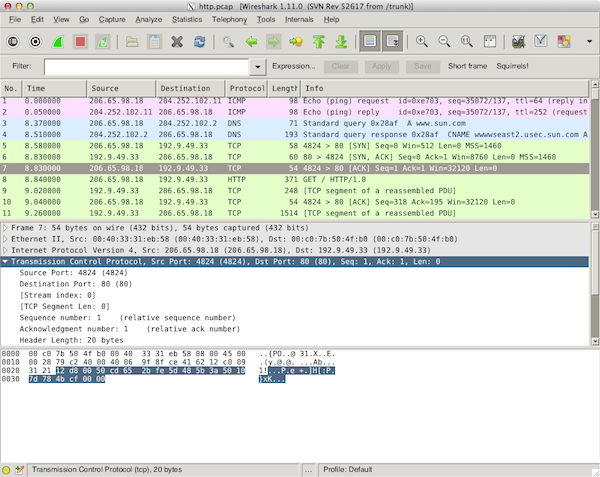 You can register at http://bit.ly/wireshark2. The final 2.0.0 release should be available in a couple of weeks. I’m excited about the new UI and about the opportunities that it provides for new features and further improvements. Historically we’ve had no good answer to these complaints – Wireshark and tshark both only do what is called stateful dissection. This means that they store what they’ve seen in memory and use that information to provide additional details about future packets, for example by matching requests with responses. While this provides substantial benefits � reassembly of protocols over TCP being probably the most obvious � it means that as the amount of traffic increases, so does the amount of memory needed to store all of that state. It also means that there’s no way for tshark to run forever unless you’ve got infinite memory (what’s your secret!?) or no traffic at all. The big news in the tech industry this week is The Heartbleed Bug, a vulnerability that affects a large portion of secure web sites on the Internet. I updated the Wireshark and WinPcap web sites on Monday (along with reissuing and revoking certificates) shortly after OS patches were released. Our web sites are protected going forward, but what about the past? We have a Shark appliance in our environment but that leads to a challenge. We had about 350 GB of HTTPS on our network on Monday alone. This is just slightly too large to load into Wireshark. Applying this filter directly on the Shark appliance gave me a much smaller number of packets which I could easily analyze in Wireshark. So far I haven’t found anything suspicious. This entry was posted in Analysis, Security. 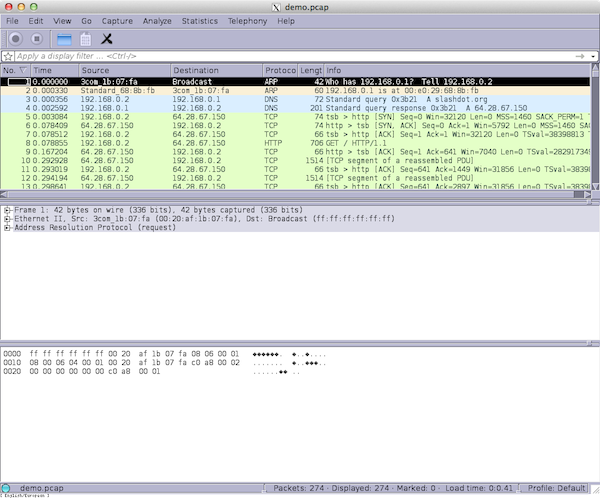 Yes, I know it�s been a while since tip #1 video (https://blog.wireshark.org/2012/10/wireshark-tutorial-series/?utm_source=rss&utm_medium=rss&utm_campaign=wireshark-tutorial-series) and this one. Judging by the number of views and comments, it is helping. So keep me honest by reminding me to post more often!